Sometimes you take a year-and-a-half hiatus from your blog. It just happens. For quite some time, I’ve been meaning to begin updating this site more frequently, and now I’m finally getting started! While there hasn’t been a whole lot of activity on this site, there are several site updates that I would like to mention. 1. Rosters Up-to-Date – Rosters for all MLB and MiLB teams are still being updated on a daily basis. FixedIt roster files require the Manager’s name to be included, and those names are now being updated automatically (so, you will see that Clint Hurdle is finally reflected as the Pirates’ Manager!!). Also, I hadn’t updated the Minor League Teams for about two years, and there had been several name/affiliation changes (for instance the Bradenton Marauders became the Pirates’ Class A Advanced team). Those are now up-to-date. Check out all of the files on the Roster Files page. 2. 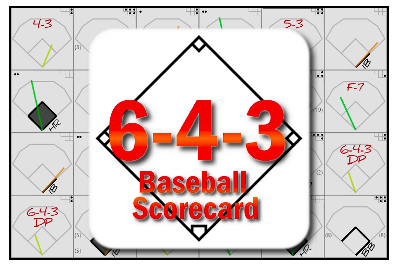 6-4-3 Baseball Scorecard – Ryan Blume has created a baseball scoring app for Android called 6-4-3 Baseball Scorecard. I’ve tested it out for a few games, and it’s pretty cool. Even better, the app is capable of importing rosters from PitchByPitch, so users can begin scoring games with very little pre-game setup. I encourage you to check out his app, and I plan to write a more thorough post about 6-4-3. 3. Retrosheet Scorecard – I haven’t made many updates to my Retrosheet Scorecard, mainly because I feel like I’ve hit a wall with the amount of progress that I’m able to make. Still, I think it is a good tool for anybody who wants to do play-based (but not pitch-based) analysis. I also feel limited with the technology on which the scorecard is built. I’m not crazy about the fact that it requires Microsoft Excel to run. I’ve been making a lot of progress on a web-based version of the scorecard. Expect more posts on this as well. 4. Game Logs – This is probably the most significant update that I have. 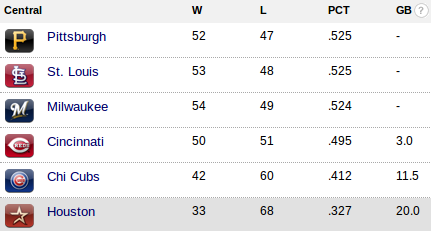 I’ve always enjoyed that MLB makes their “Game Notes” available every day. Essentially, these are mini Media Guides (or Press Passes) containing lots of team statistics, but focused on that day’s particular game and opponent. I love the amount of information that is contained within the Game Notes, but I also think that they lack concise statistical data. For instance, if I want to quickly find how many hits Andrew McCutchen has this season (a reasonable question), that information isn’t easily available. Also, Bill James e-mails his Daily Match-Up reports that list hitters and pitchers for both teams in a tabular format, along with how each hitter has historically performed against opposing pitchers. This is another report that I enjoy reading every day, but it also has its downfalls. Many of the batter/pitcher match-ups have never occurred, so the only available information is 0-0, .000. Or, perhaps, they have met once, and so the sample size is too small to be meaningful. (To receive these match-up reports for your favorite team, e-mail the name of your favorite team to matchups@actasports.com). I decided to make the effort to create my own daily report. The reports contain one page for each team, and that page includes: team results broken out by opponent, division standings, wild card standings, last ten game results, and individual stats for each player on the 40-man roster. These reports are generated automatically each morning, and I encourage you to check them out on the Today’s Games page. Soon, I plan to add the capability for these reports to be e-mailed to fans every morning. I would love to hear any and all feedback that you may have! Like I said earlier, I hope to continue updating this site more frequently. I plan for these updates to be more focused on the niche of this site, and less focused on day-to-day happenings in the Pittsburgh Pirates’ world. Raise the Jolly Roger and Where Have You Gone, Andy Van Slyke do an excellent job of that. However, pictures like this one will never get old.